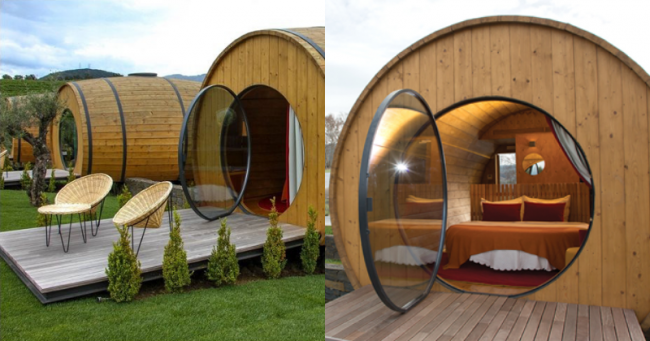 Well, you can now wake up to a lovely porch that opens to sprawling vineyards, and sleep in a giant wine barrel! The Quinta da Pacheca estate, a 140-acre vineyard, offers this unforgettable experience for wine lovers. Visitors can have various different wines, and explore their 15 rooms where wine is made. When tired, they can rest in the comfortable, wine-barrel-shaped suite that’s 30 meters in size, while staring in the skylight window just above the bed. The elegant wine barrels are part of an estate that’s almost 3 centuries old, and the suites are made of pinewood on the outside and are lined up one after the other. “Located in Lamego, the Wine House Hotel at Quinta da Pacheca estate offers guests the opportunity to stay in a 98-foot cedar wood suite overlooking the Duoro River. Quinta da Pacheca created the 10 wine barrel suites, all named for a different wine grape, in 2018 as part of a “bold architectural” project, according to the winery’s website. You can also live inside one of the 8,000 wine barrels at Alde Gott in Germany, or visit the Hotel de Vrouwe van Stavoren in the Netherlands, and enjoy the similar experience. Therefore, wine lovers, you have more options to consider when planning your dream vacation, so hurry up and make sure you explore them as soon as possible!